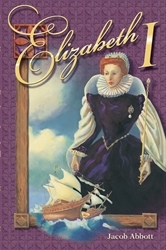 Elizabeth had the fiery red hair and bold spirit of her father, Henry VIII of England. She also had his temper and determination to rule. And rule she did—over her country’s great explorations, victories, and unprecedented prosperity and power. Follow Good Queen Bess from her perilous childhood to her glorious reign as one of the greatest monarchs the world has ever known. Biography written by Jacob Abbott. 204 pages. Gr. 7–12. See also our other books in the Abbott Series, classic biographies with lessons from “history makers” carefully woven into the fabric of a thrilling life story. These books that seek to portray the character of their subjects accurately are designed for personal benefit and also recommended for book reports.